Certainly a contender for Blade of the Immortal’s most memorable secondary character is Shira. He’s an irredeemable sadistic brute, so demented that when his hand was chopped off he filed the remaining bones to sharp points to create himself a weapon to replace the second sword he could no longer carry. With Hiroaki Samura nearing the end of this long-running series, in Snowfall at Dawn he starts resolving some issues and here presents the showdown between Manji and Shira, although it’s epic, so continues in Blizzard. 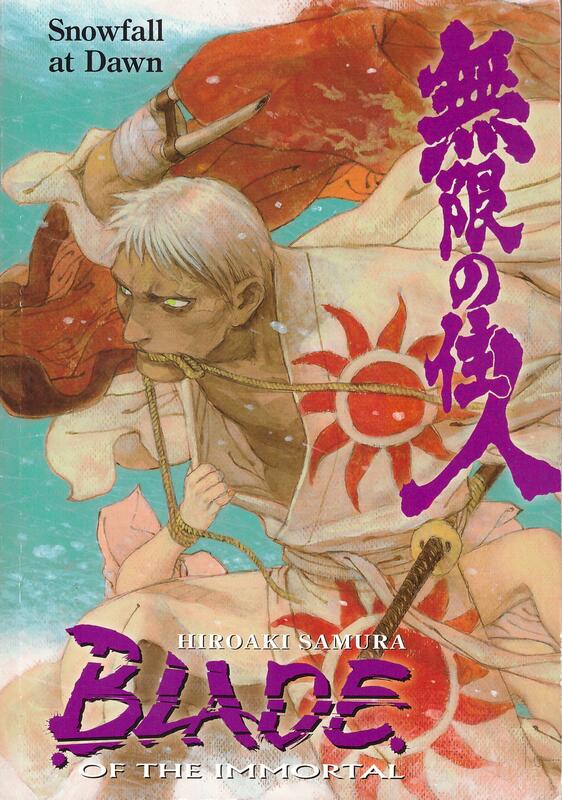 Before that, however, there’s some unfinished business from the previous Massacre, and it’s one of those occasions we can be thankful Blade of the Immortal is in black and white otherwise the pages would be bleeding red. 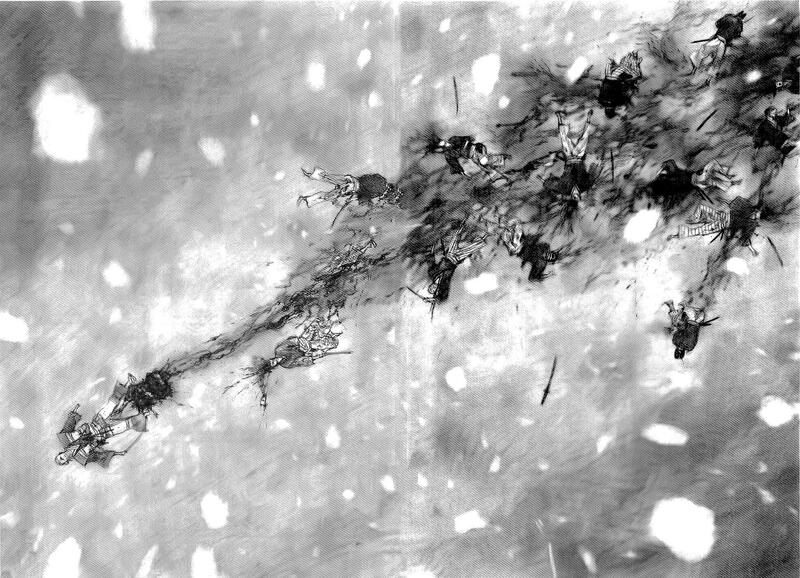 The opening chapter is an epic fight sequence pitting one man against fourteen, and ending in a spectacular view of the results from above (sample art). While Manji’s battle with Shira is the centrepiece of Snow Fall at Dawn, it’s certainly not the only plot thread in play. For starters, Samura has stacked the odds in Shira’s favour. Not only does he have a new arm, he’s come into possession of surgeon Ayame Burando’s final speculations on the nature of Manji’s regenerative abilities. If this wasn’t advantage enough, Manji also has to concern himself with Rin’s whereabouts, so further distracting him against a deadly opponent. With the battle still unfinished, Samura switches to a rescue scene over 33 unbearably tense pages. It’s masterful for the knowledge of what’s still to come, and by the end of the book several other known faces have appeared. It’s entirely possible that someone might pick up volume 25 of a long-running series as their first sample, and if so, while the impact won’t be as great as for those who know the cast, there’ll still be an enormous amount to admire. The trap set toward the end is ingenious whether or not you care about the person involved, and the art is utterly spellbinding in places. They’ll be struck by the sheer perversity of Shira, and other personalities are seen long enough to make an impression. There are, however, no concessions to new readers, although in Japan brief synopsis pages by Samura’s assistants preceded each new chapter. Some are presented in the back of the book along with a couple of gag strips. Samura’s done his job exceptionally well, though, and you’ll want to head straight for Blizzard.